Emily Townsend is the paid companion of the dowager Countess Bradleigh. When the dowager's grandson, the Earl of Bradleigh, announces his engagement, the Countess sweeps her household to London to get a good look at the girl. There she finds that Bradleigh is planning on marrying for an heir, not because he has any real affection for his fiancée. To his surprise, the more time he spends with his grandmother's companion Emily, the more he feels for her--and he begins to suspect his engagement is a terrible mistake. 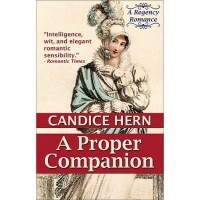 Emily, meanwhile, has more suitors than she'd ever dreamed of and a scheming pair of relatives to deal with besides. Her cousin inevitably kidnaps her, Bradleigh goes to rescue her, in so doing sundering his engagement, and they all pair off and live happily ever after. Workmanlike. There's nothing here I objected to, but also nothing I was excited by. It feels written by rote.